The Hendrickson Group is a small biochemistry research group focused on characterizing unusual mechanisms in protein biosynthesis. There are three people dedicated to this unfunded project: Associate Professor Tamara Hendrickson and two graduate students, Whitney Wood and Udumbara Rathnayake. We are interested in how bacteria accurately synthesize their proteins and how they can choose to purposefully introduce inaccuracies into protein biosynthesis as a mechanism to survive environmental stress. Our work focuses on a process called indirect tRNA aminoacylation and we study this pathway in three human pathogens: Helicobacter pylori (causes stomach ulcers and cancer), Staphylococcus aureus (causes skin and blood staph infections and is often resistant to multiple antibiotics), and Mycobacterium tuberculosis (causes tuberculosis). The figure shown below highlights one of our discoveries. 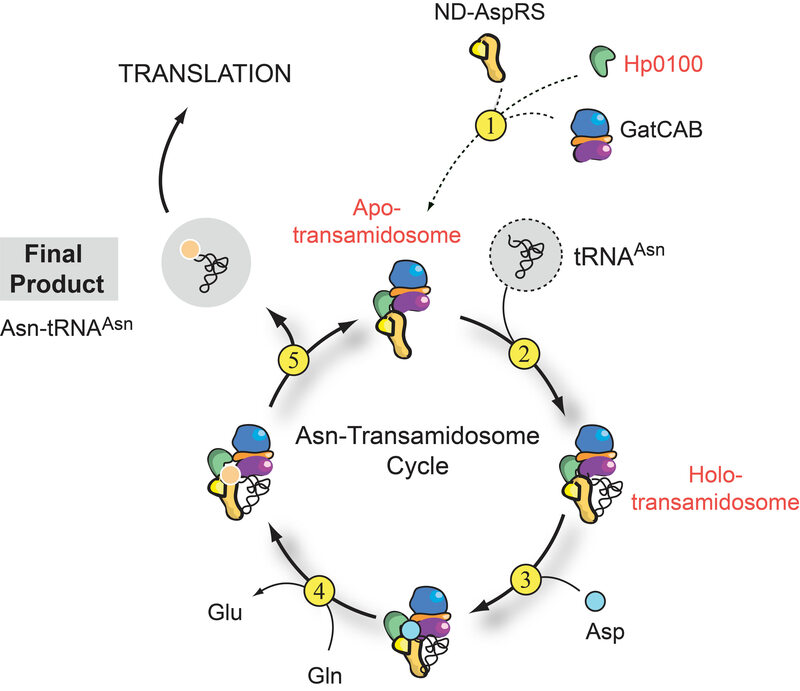 We discovered that the protein call Hp0100 (from H. pylori) facilitates indirect tRNA aminoacylation and the production of Asn-tRNA(Asn). We are currently studying how Hp0100 accelerates this process and examining whether or not it is a stress-responsive enzyme. You can read more about our initial characterization of Hp0100 in the following publication: Silva et al. Journal of Biological Chemistry, 2013, 288, 3816-3822. This is a basic science research project. Results will be published in peer-reviewed research journals. In the immediate term, donating to this project will help support this important research and the continued education of my two graduate students and their progress towards their PhD degrees. In the long-term, we hope that this research will lead to a better understanding of how human pathogens survive stress challenges and possibly to the development of better antibiotics against this important pathogens.